According to the official charts, the bar at Hinchinbrook Island is too shallow for us to cross. However, there is an active three-mile long sugar loader with leading lights across the shoals to a jetty, showing that the channel is regularly used. In addition, we’d emailed Nancy and John on Alana Rose who had recently crossed the bar, and they told us that they’d had good depths at high tide. We had no problems getting across. The leads and navigation buoys took us so close to the sugar loader and the old molasses jetty that it was possible to chat quietly to the fishermen as we glided past. There was still very little wind, so we motor-sailed up the passage (or ‘did a Bob’ as we call it, in honour of another blogger who circumnavigated Australia in a Bavaria with, as far as we can tell, his engine running most of the time). 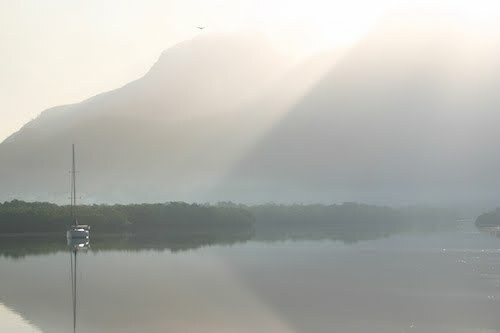 Hinchinbrook Channel is about twenty miles long and allows you to squeeze between the mountains of Hinchinbrook Island to the east, and the coast-hugging Cardwell Range to the west. 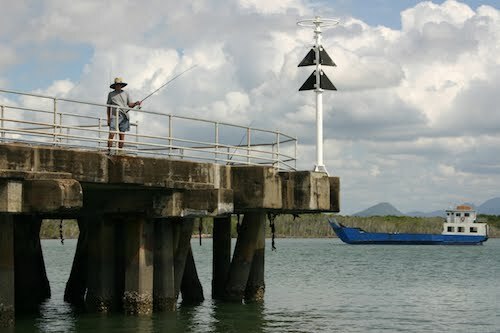 The Channel is lined with mangroves which provide a vivid bright green contrast to the darker green gums behind, while the stark rock of the mountains looms impressively in the background. After a very scenic day, we pulled off the main channel into Gayundah Creek, one of the many drainage creeks that cut down from the mountains and through the mangroves. The breathless quiet was broken only by the occasional call of a bird or splash of a fish in the shallows. In the background we could hear sporadic ‘clunk’ noises that sounded vaguely like a branch snapping, or somebody slapping the water. We guessed that they were either made by frogs or by air bubbling up from the swamp mud, although we never did get to the bottom of it. The many secluded and winding tributary channels just cried out to be explored, so we unshipped the dinghy and spent a happy afternoon alternately motoring and paddling in the shallows. The creeks were teeming with life, from rays and bait fish in the water, to crabs and white herons on the mud, to scintillating kingfishers flashing through the air. Paddling gently back home, we got a clear view of our stern. One way of spotting a proper cruising boat is to see how much junk is hanging off the back. 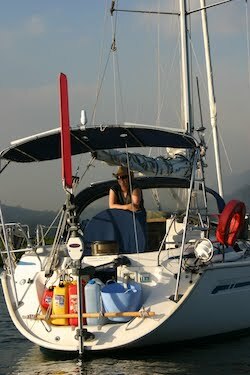 This entry was posted in Australia, Oceania, Travel, Voyage of Pindimara and tagged Sail on 2009/08/10 by Reinhard. It was stunningly beautiful, I will admit it.Ii did have a wee problem with the sandfly infestation though, I am still scratching and its been a 3 days. ugh.